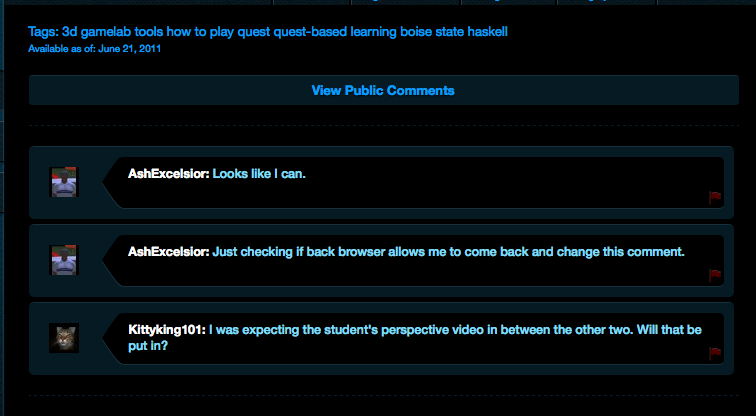 Hi guys, did you mean for gamers to be able to go back in the browser to submit multiple public comments on a quest. Because you can. I just did it accidentally in the Tools of the Game quest. My question is, how did you get back to the comment field? Just using the back button whilst browsing. In actual fact I did a test by not writing anything in the public comment box to see if it would let me continue or if it would just post a blank response. It did let me continue but did not post a blank response which I thought was good as some students may not wish to give a feedback comment. However I then just used the cmd+< left arrow to go back and see if I could change my comment and it let me go back and gave me a new empty comment box so then I just did it a couple of times to see how it would react. Both times it gave me a new clear box so I could type a new comment and post it again est voila!